After months of teasing that he was writing a new script, M. Night Shyamalan has finally broken his silence in a storm of tweets. His latest movie Split, released in January, has earned more than $275 million worldwide on a modest budget of $9 million and has been hailed as a return to form for Shyamalan. SPOILER ALERT for those who have not seen Split ahead. Shyamalan has said that the Split ending, which tied the film to fan favorite Unbreakable, was 15 years in the making and that he went to great lengths to keep it a secret, so much so that he left the last scene out of test screenings. 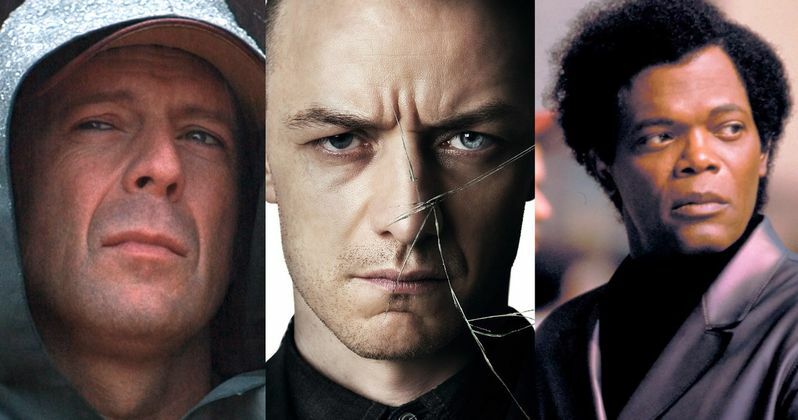 For months speculation over the possibility of whether or not M. Night Shyamalan would be tackling an Unbreakable sequel or a Split sequel erupted after the release of Split and today the speculation ends. The answer is both. The director announced today via Twitter that a dual sequel to both movies will be released on January 18th, 2019 through Universal Pictures, and it's been titled: Glass. "Finished the new script. It's taken 17 years but I can finally answer the #1 question I get, 'Are you making a f#&@ing sequel to Unbreakable or what?' My new film is the sequel to Unbreakable AND Split. It was always my dream to have both films collide in this third film." It is now confirmed that Glass will be a sequel to both Split and Unbreakable. This is huge news to say the least. The end of Split welcomed back Bruce Willis as David Dunn and tied Split to the Unbreakable universe, hinting of a possible crossover between the two films. Shymalan recently shared that Split had always been conceived within the Unbreakable universe and that the main character, Kevin Wendle Crumb was in the original script for Unbreakable. The writer/director has also said that some of the scenes of Split were written over 15 years ago. Shyamalan also confirmed the return of Bruce Willis as David Dunn and Samuel L. Jackson as Elijah Price/Mr. Glass for Glass. James McAvoy will also return as Kevin Wendell Crumb as will Anya Taylor Joy as Casey Cooke. It is not yet known what the plot will be for the sequel, but knowing Shyamalan it will be a different beast than the first film. Shyamalan has said in the past that he would not do a sequel for financial gain, he would only do it if his heart spoke to him. It definitely seems as if his heart beat out is often talked about "writing demons" this time around. While Unbreakable was not Shyamalan's greatest hit, it has been a fan favorite and has gained a cult-like status throughout the years. Unbreakable was released in 2000 and earned $248.1 million on $75 million budget and was seen as a box office disappointment when compared to smash success of The Sixth Sense in 1999. Glass is set to be released on January 18th, 2019 through Universal Pictures and is sure to be a Shyamalan twist on the trilogy.